The retirement you want starts with a personal consultation. Talk with a Wealth Pinnacle Retirement Planning Specialist and get specific guidance to help you plan for and transition into retirement. If you're already retired, we can definitely help you too. Our Portfolio Managers will construct and manage a portfolio tailored just for you. Take control of your retirement with confidence and personal guidance. Wealth Pinnacle Retirement Planning Specialists will guide you in developing a solid strategy for getting the most out of your retirement. Achieving your goals takes careful financial planning, expert investment advice and a range of resources to stay on track. That’s what we offer every client; One-on-one advice and resources to achieve your financial goals. Stop worrying about retirement. Plan for success. ~ Your comfort level with investment risk. * Any major milestones you want to achieve. > The investment strategy that's right for you. Do you have a written plan forecasting income and expenses in retirement to ensure you don't run out of money? Are you on track with retirement savings? * Learn retirement planning steps you can take to enjoy your life. 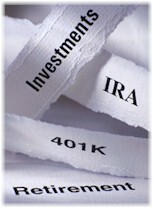 Choose investments to generate your retirement income. Whether you’re looking for investments that generate income, grow in value, or both at the same time, Wealth Pinnacle has a solution for you, and can help you understand your investment choices. See where you stand with your retirement—and what to do next. Contact Wealth Pinnacle to get started. We’ll schedule your personal retirement consultation and tell you what to expect and how to prepare. Reduce your stress level and enjoy your life with a clear plan. Do you have retirement assets all over the place? ~ Handle your account setup and make fund transfers hassle-free. Contact Wealth Pinnacle to schedule your retirement consultation and get the personal advice you need for a secure retirement plan. The initial consultation is free!